We started off our morning going to the Blue Ridge Parkway for an insect outing with some other kids and a nature guide. Luke loved every minute of it – Emma and Drew were a little bored by the end – Emma because she’s not to into bugs and Drew because he’s four. We headed to the Cornerstone Downtown building for pizza with some friends from church and then to the chilly pool. I don’t know how I always pick pool dates when it rains the night before and brings in cool air and cooler water in the pool. It has been 90 degrees everyday for the past week and it was 73 and breezy on our pool day. I like it to be hot when I go to the pool. The kids swim team practice was cancelled because of rain and stormy weather so we got to spend the night at home. I fixed burgers on the grill and fried green tomatoes. Then we all sat in front of the TV (something we do very little of in the summer) and watched the olympic swimming trials. Since my kids are swimmers they love to watch the swimming events. They go get their ribbons and look at the their times compared to the olympic swimmers. I love summer and the fresh veggies and herbs. I got green tomatoes at the farmer’s market and fresh cilantro and dill from my garden. Here is an easy recipe for fried green tomatoes. It is really yummy. If you are not a meat eater – this is a great way to make a fried green tomato sandwich – just leave off the burger. Great summer supper in the south. These little cup cake pops are seriously cute. Check out the recipe and how to at bakerella. 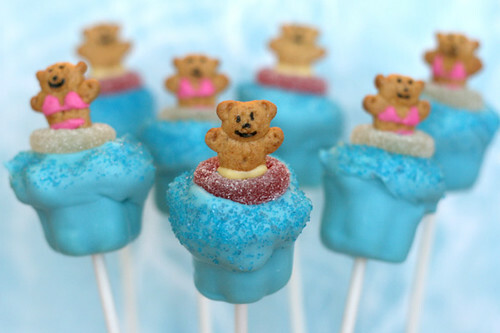 This lady makes the cutest cup cake pops for all occasions. I made the basic recipe and they were a hit. Basically you bake a box cake mix (any flavor you like) crumble it up and add a can of store bought icing to the crumbled cake and roll the mess into balls. Freeze them for 30 minutes, dip them in chocolate and the possibilities are endless as you can see from the blog. So who’s throwing the pool party ? I’ll bring these cute cup cake pops. I still haven’t gotten into a blogging routine. When I get ready to sit down and post I have about 20 things I want to write about and pictures I want to post. Today we had a kitchen full of screamy 8 and 9 year old girls over to make pizza. It was Emma’s idea to have a Cooking Club this summer so this is the second time we have gotten the girls together to cook and have fun. We made granola bars the first time and make your own pizza today. Lots of fun and yummy. I’ll post pics and recipes later. Since we have taken a vacation from our school work I just don’t seem to ever get to the computer as much. I have been busy trying to get some cleaning and organizing done and we have been on the road alot so the blog has been quiet. I hope to settle into a schedule soon and start being more consistent. I want to update the look of my blog and get a new header and background so I hope to do that soon. If you know of any good sites with blog headers leave me a comment.